"They uncovered his face, now clear and serene, and bared the chest wracked by 40 years of asthma and months of hunger in the wilds of the Bolivian southeast. Then they laid him out in the laundry room at the hospital of Nuestra Señora de Malta, raising his head so all could look upon the fallen prey. As they placed him on the concrete slab, they ... asked the nurse to wash him, comb his hair, and trim the sparse beard. By the time journalists and curious townspeople began to file past, the metamorphosis was complete: the dejected, angry and disheveled man of the day before was now the Christ of Vallegrande ... The Bolivian army had made its only field error after capturing its greatest war trophy. It had transformed the resigned and cornered revolutionary ... into the magical image of life beyond death. His executioners had bestowed a human face upon the myth that would circle the world." I wrote these lines about Che Guevara's death and the pictures of his body 15 years ago about another time, another place and another photograph. But they may help us understand the dilemma faced by Barack Obama and the U.S. with regard to a different death and a picture we may never see. A hideous image of a destroyed, distorted face and corpse confirms nothing; the photograph of a cleaned-up, open-eyed, well-treated body is proof of death but creates a martyr. With time, we will know which was the better solution: the Bolivian or the American one. For Guevara's admirers, any comparison between the Argentine doctor and Osama bin Laden is hateful; for the al-Qaeda faithful and many others, any analogy between their fallen idol and a communist infidel is worse than heresy. But the conundrums resulting from their respective executions are not dissimilar. Guevara was executed in October 1967 because there was no solution to the complications his capture would have entailed. To try him in Bolivia risked thousands of protesters' storming embassies all over the world and Fidel Castro's sending special-ops teams to rescue him; it was not an option. Having the U.S. fly him to the Panama Canal Zone (the equivalent of Guantánamo) would have simply confirmed that Guevara was fighting imperialism, not a Bolivian army of peasants and poor workers. Much the same seems to have happened in Abbottabad. First, as in Bolivia, and regardless of instructions or intentions, taking bin Laden alive would have created an insoluble problem. There are valid legal and moral issues here, but there were also real-world questions without good answers. If taken alive, where would he have been tried? In the U.S.  in New York, which would not allow a trial of Khalid Sheikh Mohammed to take place? Who would have tried him? The International Criminal Court, which the U.S. does not belong to? A Pakistani court? All the contradictions of the Guantánamo process would have been reproduced, but in spades. However weakened bin Laden and al-Qaeda might have become, there would have been no shortage of devotees across the Muslim world and elsewhere who would have protested, or taken American hostages and demanded bin Laden's release. Then would have come the problem of the body. Even after al-Qaeda acknowledged bin Laden's death, the incredulous persist. The best way to discredit skepticism about his killing would be to show the photographs. But doing to him what the CIA and the Bolivian military did to Guevara almost 45 years ago would have perhaps wrought the same counterproductive feat: bestowing upon Osama bin Laden a clean, serene, exemplary image just right for martyrdom. The analogy can be taken one step further. 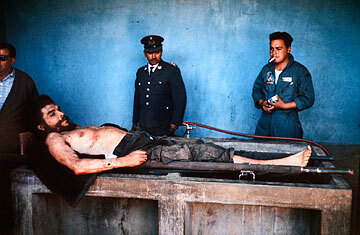 The Bolivians claimed for 40 years that Guevara's body had been cremated in order to avoid the emergence of a memorial of any sort. It turned out, according to the Cubans, that he was not cremated at all. His remains were recovered near a cemetery in Vallegrande and taken to Cuba in 2007, where a shrine was built to house them. The Americans buried bin Laden at sea for many reasons, but one certainly was the need to ensure that there be no shrine, no meeting place, no memory with a site to support it. See the top 10 defining moments of the post-9/11 era. See TIME's complete coverage of Osama bin Laden's death.